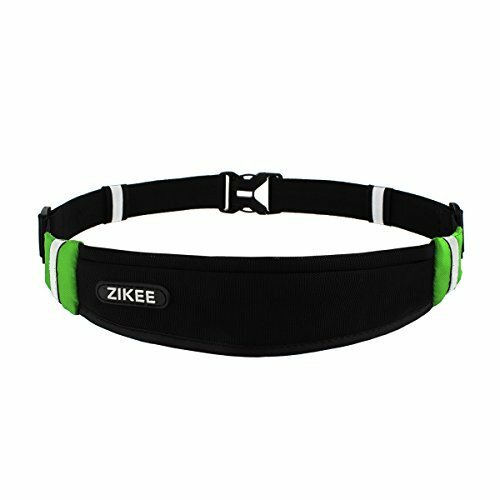 Zikee running belt is perfect for all forms of exercise and for men&women(damen)&ladies&kids. - Superior Material - Made from nylon with a bounce-free design to eliminate movement. - Light in weight & One large pocket - No Chafing and doesn't add bulk so you won't get weighed down while running. Expandable pocket in a lightweight belt allow you to easily carry your phone, keys, cards, money and energy bars. Dual pockets allow you to separate your phone and keys to avoid scratching. 1.Warranty period: 1 YEAR Warranty from the date of purchase. Adjustable waist band - Zikee running belt suits for the waist size of 29"/74cm - 39"/100cm, and can be up to 51"/130cm with fully adjustable elastic straps. A good designed product for runner, athlete, camper, player, traveler, especially large waist users. Sports running belt/running pouch belt/bag belt/workout pouch/slim workout fanny packs/waist pouch bag/race belt for sports men&women. Elastic large plus size pocket - Providing enough space for cellphones and essentials. Such like smartphone, phones, earphones, Bluetooth headset, car/home keys, cards, cash, wallet, moeny, fitness gear, energy bars, lip gloss, passport, drivers license, chargers, battery packs, and power bank along with you. Versatile sports belt - Can be used for outdoor and indoor sport, such like Fitness, cycling, Jogging, yoga, walking, jogging, running, hiking, riding bikes, cross fit training, weightlifting, golf, basketball, football, camping, working out at the gym and more. This is really a great way to carry essentials for sightseeing tours, like a day trip to theme parks, museums, zoos, and even a baseball game! Fits for most smartphones - Including Apple iPhone 4, 4S, 5, 5S, 5C, 6, 6S, 6 plus, 6S Plus, Blu Advance, BlackBerry Passport, Google Nexus 4, 5, Lg g4/g3, Samsung Galaxy Note 2, 3, 4, Samsung Galaxy S6, S6 edge, S5, S5 Mini, S4, S4 Mini, S3 Mini, Galaxy Tab3, Galaxy S Duos, Sony Xperia M, Z3, Z2, it might also be too small for other smartphones with very bulky cases. One year warranty - Hand washing preferred. If you have any issue with this product at any time, please always contact us first before leaving feedback/review. We will strive to fix the issue to your full satisfaction. Guaranteed! If you have any questions about this product by Zikee, contact us by completing and submitting the form below. If you are looking for a specif part number, please include it with your message.